The Booklyn Artist Alliance is pleased to announce the publication of Haiku Not Bombs. 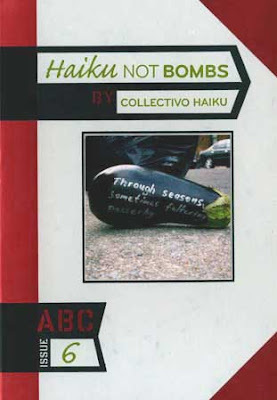 Haiku Not Bombs is an outgrowth of the haiku year, published by Soft Skull Press in 1998. In 1996, a group of friends made a commitment to write one haiku a day and mail them to each other. At the end of the year, they realized that their collection of simple, critical observations had given them a new way to look at the details of their lives. Original members of the project included Michael Stipe, Grant-Lee Phillips, Tom Gilroy, Jim McKay, Anna Grace and other contributors from diverse artistic backgrounds ranging from pop music and theater to independent film. In the current incarnation of the haiku year project, several of the project's founding members decided to continue with their haiku practice, inviting new writers to take part in a new collaborative project. The challenge was reduced to writing one haiku poem for every week of the year. The collection of contributors to the current manuscript, include Tom Gilroy, Jim McKay, Grant-Lee Phillips, Denise Siegel, Biskit Roth, Alison Roth, Patrick So, and Shin Yu Pai. The poems in Haiku Not Bombs range from the one-line hokku form and the Filipino hay(na)ku to linked verses (renga) and the loose western style haiku favored by writers like Jack Kerouac and American practitioners of the craft. Some emergent themes include modernity, urban life and the everyday. Tom Gilroy lives in New York City where he works in film and theatre. In the last few years he has released the feature film Spring Forward, the books Spring Forward and the haiku year. He currently writes for the political blog The Huffington Post and the comedy revue Wake Up, World, which he created with Lizz Winstead. In the works are the publication of his collected plays and theatre pieces, his new book of haiku Volunteer Geraniums, and principal photography on his new film Bad Muslim. Jim McKay is a filmmaker, husband, and father. He lives in Brooklyn, USA. His haiku have appeared in the haiku year, Snapshots 12, and Noon. Shin Yu Pai lives and works in Seattle. She is a poet, photographer, bookmaker, and editor. Her works include Works on Paper, Sightings: Selected Works, The Love Hotel Poems, Unnecessary Roughness, Equivalence, and Ten Thousand Miles of Mountains and Rivers. Visit www.shinyupai.com for more information. Grant-Lee Phillips is best known as a songwriter and vocalist. The former leader of the seminal '90s group, Grant Lee Buffalo, Phillips continues to garner international acclaim as a solo artist. A resident of Los Angeles, Grant-Lee Phillips enjoys a diverse career which extends to music, acting, film composing, visual art and poetry. Allison Roth is a graduate student at Cal Poly Pomona, studying the effects of climate change on desert plants. She wrote many of these haiku as a student at Whittier College and as an intern for the National Park Service. Rick "Biskit" Roth has been a human rights activist for more than 20 years, coordinating a dedicated group of Amnesty International volunteers in Somerville, MA. He also serves on the Board of Directors for Students for a Free Tibet. He is owner of Mirror Image, an award-winning T-shirt screenprinting factory, known for its creative designs and innovative printing techniques. He is the proud father of eight children. Denise Siegel is an alumni of CalArts. Her one-act play, Where the Chips Fall, was produced by Theater Unlimited. Her novel Americhrist won an editor's choice award at the SDSU Writer's Conference and is currently in the quarterfinals for the 14th Annual Writer's Network Screenplay & Fiction Competition. Denise's visual art is currently represented by Gallery 825 in Los Angeles. Patrick So is a man of science, a lover of the arts, and a student of life. He lives in New York City. Get your copy from Booklyn here. However, there's a price for entering such a spectacular marketplace; one so steep that it could be argued that all the economic advantage goes to Amazon alone. The standard fee for small presses working through the Advantage programme is a staggering 55% of a book's cover price. In addition, publishers are also responsible for the cost of shipping their books to Amazon warehouses. This puts these publishers in the horrible position of having access to arguably the best book distribution system ever devised, while being charged so much for the privilege that it becomes difficult to impossible for them to make any money. This 55% charge comes on top of the considerably higher production costs smaller houses face in comparison to larger houses (who also have the power to negotiate lower fees from Amazon). The rice structure of the book printing industry usually rewards high volume jobs, which means that since small publishers on average print far fewer books they are charged much more per book than their larger counterparts. So between these printing and shipping costs and the high fees, it's possible in some cases for small publishers to actually lose money when working through Amazon.